To get a Quick Quote for your conservatory roof blinds please follow the instructions below, enter the values into the calculator and press the “Get Quote” button. 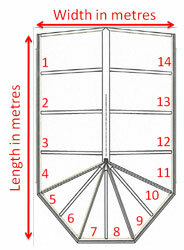 Measure the width and length of your conservatory (in metres) using the example guide diagram on the right. Count the number of roof panels (e.g. 14 in the example). Select the style of your conservatory from the table on the right side of the page below (e.g. A or B or C etc.) and select it in the first box on the calculator. Click on the “Get Quote” button and your Quick Quote price will be shown in the boxes below. Quick quote for survey, supply and install of Conservatory Roof Blinds. * Prices shown above are based on “Band A” fabric, other fabrics may be more expensive, please ask for details. We offer free Quotations to sites within 25 miles of our factory in Fareham. For sites further than 25 miles, there may be a small charge which is fully refundable when an order is placed. Call our team now and we can discuss your requirements and answer any questions you may have. If you prefer, please enter your details in the form below, click the button and we will contact you. Please remember at no time will you be under any obligation to proceed and you will not receive any additional sales calls. Copyright © 2015-2019 Marla Custom Blinds. All rights reserved.